Mr. Adamson's notable commercial achievements are legendary and are well covered by other sites across the internet. In this page, the webmaster after his personal odessey through the archives in pursuit of his own relationship to Mr Adamson, aims to create a new timeline sprinkled with a collection of new and old facts about the life and times of the man. 1833 April 30 On this day, his 13th birthday he left the Edward Walton Quaker School and four days later began his apprenticeship at the Stockton and Darlington Railway works in Shildon under the wing of Timothy Hackworth. 1850 July 7 Daniel's employer Timothy Hackworth died, and later Hackworth's engine works was sold . So it appears that in anticipation of major changes in Shildon Daniel decided to to spread his wings, and having risen to the level of general manager at the engine works he removed to Stockport to take up the post of manager of Heaton Foundry which was on the corner of Gordon Street, Lancashire Hill, Stockport. 1851 Jan 24 Lavinia his second child was born at 1 Appleton's Terrace [aka Appleton Court], Nicholson Street, off Lancashire Hill Stockport. The house was a very modest abode, probably what is known as a two-up-and-two-down with a steep embankment at the end of the back-yard. Now  Nicholson Street has been cleared of the Victorian properties but the cobbled street is still there. On the crest of the embankment there now stands Pendlebury Hall, originally an ophanage; later Stockport Technical School coincidentally the webmaster's alma mater; and now, today the place is a Care Home for the elderly. 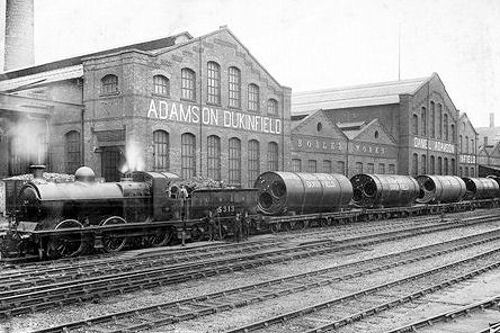 1852 In the spring Daniel moved to Ashton, Cheshire to set-up as an iron-master on his own account. The works, his first, became the Newton Moor Iron Works and was north-east of the junction of Talbot Road and Ashton Road, Dukinfied, Cheshire. 1861 In the Census and aged 41 he is described as an engineer employing "128 men and boys"; and "2 farm-men". Residence believed to have been Goodier House, Back Lane, Newton, Hyde . Present were his wife Mary, and daughters Alice-Ann and Lavinia. 1867 CHRISTMAS DAY o o o o Daughter Alice (21) and sister Lavinia (16) were baptised at St.Mary's, Newton-in-Mottram, Cheshire. Coincidentally, Lavinia died on Christmas Day in 1925. (see also 1851). The church is still there on Talbot Road. 1871 In the Census Daniel is described as a Civil and Mechanical Engineer "employing 250 workmen at Newton Moor Iron Works". 1874 Due to lack of space he re-established his business on a new site about a quarter mile to the north, at Johnsonbrook Rd. The area of the site was about four acres and well served by the railway. Photograph found via a Tameside Labour Party web-page. Thanks due to Councillor John Taylor, 28 June 2010 of Tamesside, Cheshire, England, U.K. The locomotive leading this train looks like an L.N.E.R. Robinson J11 . The Company's headed notepaper c.1890 carries many clues to the multiple activities of the business, i.e Nearest Passenger Station, Hyde Junction; London Office, Queen Anne's Chambers, Broadway Westminster; Manchester Exchange, No. 21 Pillar Tuesdays and Fridays from 2 to 3 o'clock; Manufacturers of Steam Boilers----all types and sizes; Absorber and Flange-seam Flues; Steam and Vacuum Dryers; Vacuum Pans; Pontoons; All classes of rivetted and constructional ironwork; Sole makers of Wheelock Patent Automatic expansion gear applicable to all types of engines; Electric light and traction (high speed and low speed); Blowing, rolling, compressing, reversing [? ]; Complete steel works plant; Condensing plants; Cooling Towers; Brick chimneys and boiler settings a speciality; General contractors; Pipe plants; Sewage ejectors; Goods to Adamson's sidings, Hyde junction, Great Central Railway. 1882 June 27 Daniel, at his home The Towers, Didsbury [link], was host of 76 influential guests, including some of the wealthiest and shrewest men in Manchester. It was the historic occasion upon which the decision to go ahead with the Ship Canal was made. 1885 August 8 a Saturday. Following the passing of the Ship Canal Act, Daniel the chief promoter of the Bill returned from Parliament to Didsbury. The reception he received from the people of Stockport and Didsbury is the stuff of legends. (see an account of this event here) My grandmother told me in the 1940s that aged 9 she was a guest at The Towers on that day, and I guess, probably in the company of her own grandmother Elizabeth Dent , who was Daniel's sister. 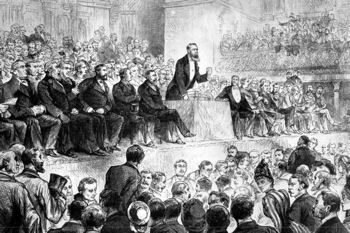 1885 October at the Free Trade Hall, Manchester, Mr Adamson 'holding forth' on the subject of The Ship Canal. 1890 January 13 Following a long illness Daniel aged 69 died at The Towers, Didsbury. 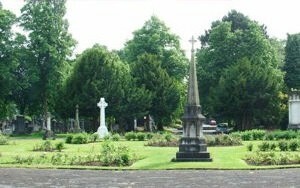 The white memorial to the left, stands over the grave of Sir John Alcock, aviator. 1894 May 21 The Manchester Ship Canal was opened by Queen Victoria. inclusion in the Annual Report of Manchester City Council of 1890. The name of DANIEL ADAMSON, which will be long remembered in connection with the Manchester Ship Canal, is also assured a place amongst the distinguished engineers by the part which he took in the development of steam engineering and the use of steel. Born at Shildon, in 1818 (sic), Adamson became apprenticed, when seventeen years old, to the celebrated T. Hackworth, at the Stockton and Darlington Railway. After serving here for six years, he was appointed managing draughtsman and superintendent engineer to the same company. This post he held until 1847, when he became manager of the Shildon works, also belonging to this Company. In 1849 he left the service of the Stockton and Darlington Railway, and after holding for a short period the position of manager to the Heaton Foundry, Stockport, he in 1851, commenced business on his own account as Engineer and Boiler Maker, at Newton Moor Iron Works, near Manchester. About this time he inaugurated a series of reforms and improvements in the construction and manufacture of steam boilers, with which his name has become associated. The first of these consisted in the introduction of the flanged seam for flue tubes, to replace the ordinary lap ring seam which was then generally used. According to Adamson’s method, the flue tubes are made in welded sections, the ends of which are provided with a flange having a radius of one inch to one and a quarter inches in the bend. Between the two flanges a hoop of flat plate is placed, and the seams are riveted up by rivets passing through the flange of one ring, the hoop, and the flange of the next ring. The seam thus formed not only adds enormously to the strength of the tube in resisting collapse, but also completely overcame the difficulties which had been previously experienced through the effect of the expansion of the flue tubes bulging the end plates. Adamson in 1852 patented this device, which in later years has been generally adopted, and still forms one of the features of Lancashire boilers. Adamson early recognised the part which steel was destined to play in engineering construction, and successfully carried through its application in the manufacture of boilers. It appears that his application of steel began about 1857 (Proceedings Iron and Steel Institute, 1879, p.113), in making a locomotive for Messrs Talabot, of Paris, to haul iron-stone from the Bonner mines in Algeria to the coast. Only puddled steel could then be got sufficiently ductile, and that was produced at the Mersey Steel and Iron Works Company’s works at Liverpool. About that time Mr. Bessemer patented his famous process for steel manufacture, and Mr. Adamson at once prepared to use the new material for boiler making, and in 1860 he made the first Bessemer steel boilers for Messrs Platt Bros., of Oldham. These boilers were 30 feet long by 7 feet 6 inches diameter, and were made of plates only 5/16ths thick for working at a pressure of 80lb. ; no better proof of the thoroughness with which Mr. Adamson completed his task can be give than the fact that these identical boilers have remained in use to this day. But in spite of Adamson’s strong advocacy of the new material, it was very little used by others for many years, chiefly because it was found too unreliable, owing to want of knowledge in the choice of treatment of the metal. Originally, steel of tensile strength of forty tons to the square inch was used, but complete success was not obtained until a milder variety having a tensile strength of thirty to thirty two tons, with 20% elongation was adopted, whereas now-a-days, in the best practice, engineers are content with a strength of 24 to 28 tons per sq. inch, and an elongation of not less than 20% in a length of ten inches. Steel plates made by the Bessemer or Siemens process, as are not only stronger, but more uniform in quality than iron, they are practically not liable to blistering or lamination as were even the best iron plates, and they are tougher and more ductile and even less liable to deterioration in work than iron plates. In all first-class boiler work steel plates are now practically used, to the exclusion of iron. When steel was first used, it was found that the plates were seriously damaged by the operation of punching the rivet holes, and, to overcome this difficulty, Adamson in 1862 introduced the method of drilling holes, to avoid distressing the plates. On Mr. Adamson’s plan, the plates are bent to their final form, and the holes are drilled through the plates when in the position they will occupy in the finished state. The plates are then taken apart, the burrs formed by drilling removed, and the plates and seams riveted up. In this way the holes fall quite true and fair when brought together, thus avoiding all such drifting as was customary with the punched holes to the detriment of the plate. The holes also being true, each rivet completely fills its hole, and takes up its proper proportion of the stress, whereas in the rough and irregular surfaces of the punched holes, some rivets might be taking an undue share of the strain, thus causing rupture at a point below the strength of the seam taken generally. Thus the seam is strengthened and made more reliable, it is less liable to leakage, the material is better utilised, and the work is altogether better and more neatly finished. These three improvements which Daniel Adamson has been prominent in bringing forward are the characteristics of the modern stationary type of boiler in this country, which is constructed for working pressures up to 200lbs. per square inch, and it would appear that Mr. Adamson has scarcely received a proportionate amount of credit for these important achievements. Moreover when Adamson commenced boiler making the manufacture of stationary boilers was carried on upon the rudest rule of thumb methods, and Adamson was the first to bring the system into the construction and manufacture of these boilers by proportioning all parts with a careful regard to the forces to be met. In this way he not only greatly reduced the weight of the boilers in proportion to their strength, but having recognised the economic advantages of using steam at high pressure, he set about to construct boilers for pressures greatly in excess of those then in vogue, and, as early as 1855, he had made a boiler and engine which worked successfully with a steam pressure of 150lbs. Ever since the theory of multiple expansion was propounded, he was a firm believer in the principle, and in 1861, he made the first quadruple expansion engine ever constructed. In the investigation of the metallurgy of iron and steel, Adamson took a leading part, and few men could boast of a more intimate acquaintance with the properties of these metals based on experience. Some idea of the amount of labour Mr. Adamson bestowed upon the investigation of the mechanical properties of iron and steel, may be formed from his own remark that up to 1869 he had tested from 30,000 to 40,000 specimens of steel suitable for boiler plates. Not only were his tests more thorough and complete than any which had preceded them, but he also made a chemical analysis of all samples tested, and was amongst the first to make practical use of chemical analysis for ascertaining the mechanical properties of iron and steel. Adamson proved by his experiments that it was possible to obtain qualities of mild steel which would be superior to the best iron for bridge building and other structures, as well as for boiler work, and in this way he aided materially in bringing about the more extended use of steel in place of iron. In the early days of steel great difficulty was also experienced in welding the new material, and Adamson was the first to point out the conditions under which successful welding was possible. Mr. Adamson also took an extremely active part in opening out the Lincolnshire iron fields, and he was the first to erect a furnace at Frodingham, in 1866, depending entirely on its supplies upon ores found in the district. The greatest difficulty was, however, in working the ore, as it could not be fused at the usual temperature of the blast furnace, owing to the presence of a large quantity of lime mixed with the ore, and a want of silica and alumina. This experience was gained at great cost, but the difficulty was ultimately overcome by the addition of Lincoln siliceous ore, which is combined with a large quantity of alumina, and these works have since been very prosperous. 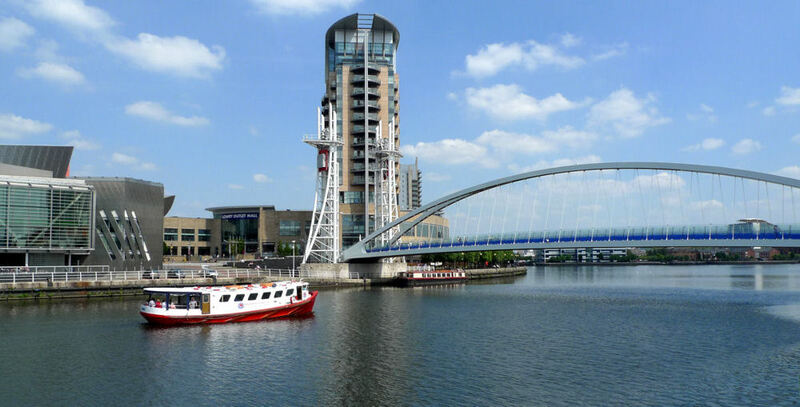 It yet remains to refer to the crowning work of Adamson’s life, which consisted of rescuing the Manchester Ship Canal scheme, and rendering it a practically possible undertaking. It is a thrice-told story how Adamson, by force of argument, succeeded in arousing the enthusiasm of the teeming millions of Lancashire workers in support of the great scheme, how bravely he fought the parliamentary battle in the face of the opposition of the greatest vested in the Empire, how the reverses which would have sufficed to paralyse the powers of less sturdy men only served to spur Adamson on to renewed efforts, and how he finally led the scheme to triumphant victory. In the great popular agitation which carried the Ship Canal Bill, Adamson was the chief actor, but finding himself less successful in dealing with the financial difficulties he retired, leaving others to carry out the work. In the course of a few years this great monument to the ability and energy of Mr. Adamson will be completed, and it is matter of the deepest regret that he should not have been spared to see the accomplishment of the great work. Mr. Adamson took an active share in the work of the leading technical societies, at the meetings of which he was a regular attendant and frequent speaker. In 1877 he was elected a member of the Institute of Civil Engineers. In 1888, the Iron and Steel Institute gave expression to their high opinion of his merits by electing him their President, and in the same year he was presented with the Bessemer Gold Medal of that body. He was elected a member of The Manchester Literary and Philosophical Society in 1881, under the Presidency of Mr. Binney. U.K., BMD copy certificates in possession of the webmaster. Baptisms at the parish church of Newton in Longdendale, in the County of Chester. Obituaries discovered by Mrs Ivy Dolan, a descendant of one of Mr Adamson's sisters. In Robert Young's book, below. See "Foreward to the 1975 edition". MANCHESTER'S SHIP CANAL - THE BIG DITCH, by Cyril J Wood. a) The town of Hyde had the benefit of another firm of boilermakers. Joseph Adamson & Co. Ltd. The proprieter J.A. also grew up in Shildon and was the son of Daniel's elder brother John, an N.E.R. engine driver. Joseph's son Dr. Daniel Adamson, became a President of the Institute of Mechanical Engineers.